Not all root vegetables were created equally. Take, for example, the celery root. What this root vegetable lacks in appearance it makes up for in taste, especially in this creamy celery root and fennel slaw. Who knew celery root was so good! I always find it amusing to see how people react when they first get a visual of this not so pretty root vegetable. 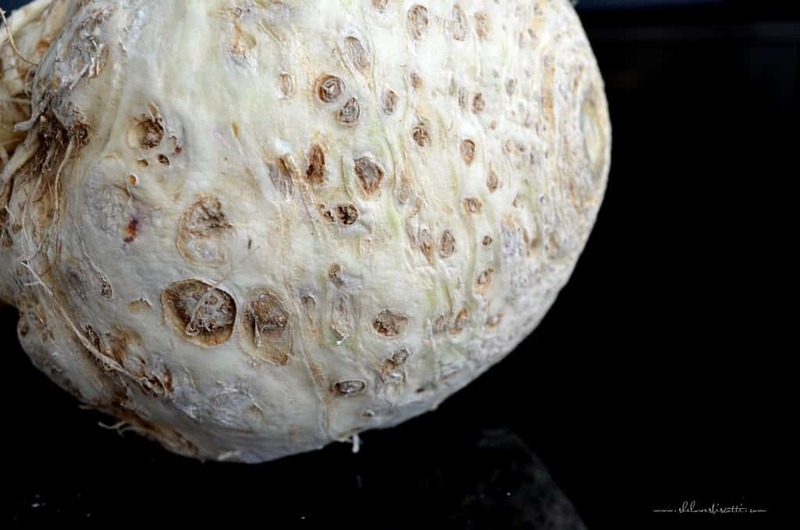 The first time my daughter saw this thing she stared, then said, “There’s something weird in the fridge.” Ah, the perfect entry into that timeless discussion about how looks can be deceiving…let’s strip away the exterior layer of this uniquely shaped vegetable to discover “what lies within”. As its name implies, it is a root, which belongs to the celery family, thereby classifying it as a vegetable. In certain circles, it can also be referred to as celeriac, knob celery or turnip-rooted celery. If you’ve never tasted celery root before, it’s a lot like celery. It has the texture of a typical root vegetable, making it extremely versatile. It can be eaten raw or cooked. It can be steamed and then mashed into a puree; it can be cubed and roasted along with other members of the root family (parsnips, carrots, potatoes, etc); it can be made into a soup or used in a stew; or it can be grated and used for a wonderful creamy celery root and fennel slaw. It truly is a wonderful and easy vegetable to incorporate in your food habits. The added bonus of this root vegetable is that it is low in calories. In order to get to the creamy white interior of this vegetable, you need to scrub and wash the root in cold running water. Once that’s done, start the trimming process. With a sharp knife, you should have no problem slicing through the exterior skin – the celery root only looks tough and hard. Just make sure you’re quick when prepping this vegetable, because it turns brown pretty rapidly when exposed to air. I used a mandolin to grate my celery root but a box grater is just as effective. I liked the combination of celery root, apples and fennel in this salad I found on Epicurious. What can I say, I can’t resist fennel! (For another great salad recipe, check out Fregola Salad with Roasted Red Pepper.) As for the vinaigrette, I wanted something creamy so I replaced the oil with mayonnaise and yogurt to keep the recipe light. I will probably add a little more parsley the next time I make it, just to give it a bit of color. And I would definitely use walnuts or pine nuts instead of sesame seeds, as well. Celery root: tastes great and a great conversation starter! Laughter guaranteed. Who knew celery root was so tasty, especially in this winter salad. 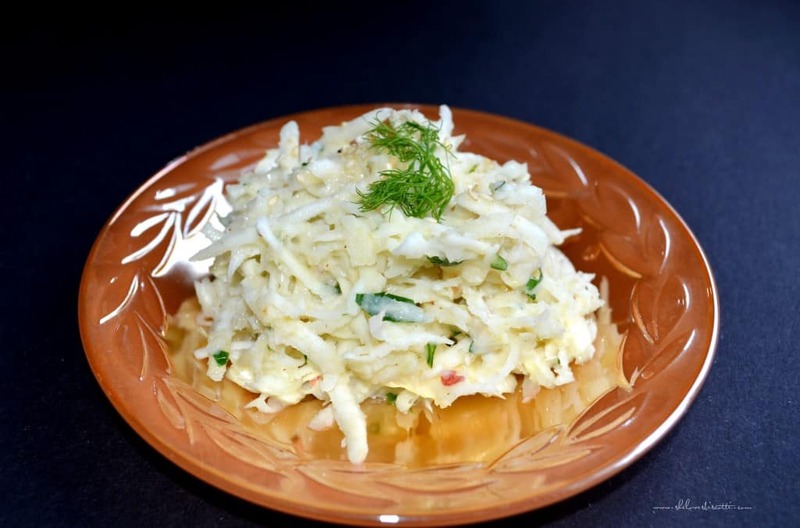 For a real conversation starter try Creamy Celery Root and Fennel Slaw. Whisk mustard, mayonnaise, yogurt, lemon juice and zest, and parsley. Add celery root, fennel, and apple. Combine gently. Cover and refrigerate for a few hours before serving. Looks so refreshing! Can’t wait to try this!